Since soon after we had our first baby, my husband and I have been planning to have a big family. I started to learn all I could about big families. I visited some I knew. I talked to older mothers at church. I read blogs by experienced moms. I wanted to find out everything I could so that when it was my turn, I’d be ready. Something that amused and puzzled me was how they seemed so put together, patient, and how they got so much done. I could barely manage to get dressed or keep on top of chores with one baby; how did they do it with 4 or 8 or 10? But now I’m there. Now I’m a mom with 4. And I get a lot more done than I ever did with 1 or 2 kids. I’ve already learned a lot! All this without neglecting my kids’ needs. Or my husband’s. I went upstairs to relax with him earlier than I used to. He was happy. The kids were calmer and listening better and helping more. You might call me super mom. But, there’s nothing “super” about it. Anyone can do what I do. I’ve learned a number of important lessons that allow me to do these things. There’s no way I would have done anywhere near this much when I had one baby. I was afraid to ever put her down or leave her. I barely took a shower when my husband wasn’t home to watch her for months. I could barely take her on a short shopping trip for the first six months because I didn’t yet know about babywearing and there was a 50% chance she’d freak out in her car seat and we’d have to leave. I never got the house cleaned because I had no systems, no knowledge of how to do it, and I was afraid to put her down to do it. And since it was just her and me, I didn’t have to do all these other things. As long as I made sure she was fed and changed, I could let everything else slide. She didn’t care if I sat in bed and held her all day, and barely ate lunch and left the house a mess. These days, life just keeps going whether I want to or not. Everyone’s up around 7 and ready for play time and breakfast. They’ll trash the house (because they’re playing, not trying to be destructive) so it has to be cleaned up. There’s a predictable feel to our day and I have to “manage” it — or else. The biggest lesson has been learning to let go of the things that don’t really matter and pack in the things that do. All the stuff I get done sounds impressive, but it comes from making different choices than I used to. I want to share with you the lessons I’ve learned. We have a routine every day, that is roughly the same. We are always up around 7, we always eat lunch around 12, we always have quiet time around 2, we always eat dinner around 6, and we always go to bed (the kids) around 8. Things change within that structure — we might spend our morning hours at the zoo, grocery shopping, or just playing at home. But the general structure, the flow of the day, doesn’t really change. Realistically, I have to stop what I am doing a lot. I have to be available to give hugs, break up fights, and nurse the baby. It’s not going to work for me to be doing focused activities that I can’t stop or to try to rush through the day. I have to build in a lot of time for each part of our routine so that we can do what we need to do without anyone getting upset or anyone’s needs not being met. The kids are much happier when they’re not pushed, either. The steady part is important too. I have to keep at it. Maybe I start dinner but the baby wakes and needs to eat now. I turn the food down or off and go attend to him, and perhaps stick him in a wrap so I can finish cooking after he’s fed. But I must keep going. I can’t sit around and wait for a “better” situation, because it’s likely one won’t come. Or if one does, it will last for all of a minute before there’s someone or something else that needs attending. I have to go with the flow on that; it’s how life is. Don’t let the crazy stop you from getting things done. Or a physical one if that works better for you. I do keep grocery lists and meal plans written down and posted prominently so I can refer to them often. My other “to do” is only mental. I know, for example, that I need to accomplish three loads of laundry and vacuuming the playroom on a particular day. I’ve learned to be realistic about my “to do” list as well. It’s not likely that I’ll get through three loads of laundry if I’m working that day (I have a babysitter come in Tues/Thurs for 3 – 4 hours). Or if we are running errands or having an outing, I don’t plan a lot of chores then either. It goes back to that “slow and steady.” I plan more for the days I’ll be home and free all day, less for the days when I have another activity going on. I don’t try to push myself in the evening hours because I know I won’t get much done then. A lot of things can really be done at once. If not at the same time, then at least in the same “work session.” I can start a meal cooking, do dishes or start a load of laundry while it progresses without attention, go back to the meal, start something soaking for later, help a child with school work, etc. all at the same time. I can spend 30 – 45 minutes doing one “set” of chores, then go sit down for awhile. I usually divide my day into several “sets” of multi-tasking. In the morning, I refill the water filter and the ice trays while breakfast is cooking. I also empty the dishwasher and perhaps start a load of laundry. An hour or so later, I might switch the laundry, start some baking or cooking project. A couple hours after that, do some dishes, wipe down counters, sweep the kitchen, switch laundry again during lunch. Mid-afternoon, more laundry, more dishes, starting dinner. After dinner, a final wipe down, starting things soaking for the next day, and tying up any other loose ends. I work hard for a short time, then I’m “free” until I’m needed again. I could forgo showers, getting to eat, rest for myself. Certainly, there are enough demands around here. But I don’t. If I want a shower, I set the kids up with a snack and a game or a TV show (gasp! the TV!) and go take a shower. It’s only 20 minutes and then I’m ready for them. Or, I sit down to eat and I let them play or, simply, wait until I am finished! (I try to take care of needs before I sit down, of course, and I get up if it’s important.) If I didn’t carve out little bits of time to take care of myself, I’d never “find” the time. And I’d be an irritable, hungry, tired mama who was no good to anyone. Take the time. My daughter really likes to hold the baby. If he is wanting to be held but I don’t feel like wearing him or need to do a chore that isn’t easy to do while wearing a baby (like bending over the dishwasher), then I will let her sit and hold him. Or, if the kids want to help cook dinner, I give them each a job to do. They like to peel and cut veggies, fetch items from the fridge or pantry, etc. Other times they want a snack but I’m nursing the baby. They want to do it themselves. Occasionally they even want to bring me a snack! I let them. They enjoy their “jobs.” They enjoy learning how to do these things and feeling like they’re contributing. And these are really valuable life skills too. Yelling at kids doesn’t help. Kids are kids and they will do things that drive you crazy sometimes. They will make messes, sometimes on purpose and sometimes by accident. I know I want to yell when they do this…and sometimes I do, of course. Other times I try really hard to do it a better way. I pause, close my eyes, take a breath. Then I look the child in the eyes and speak softly. They usually realize I am serious and then listen much better than if I lose it and scream. 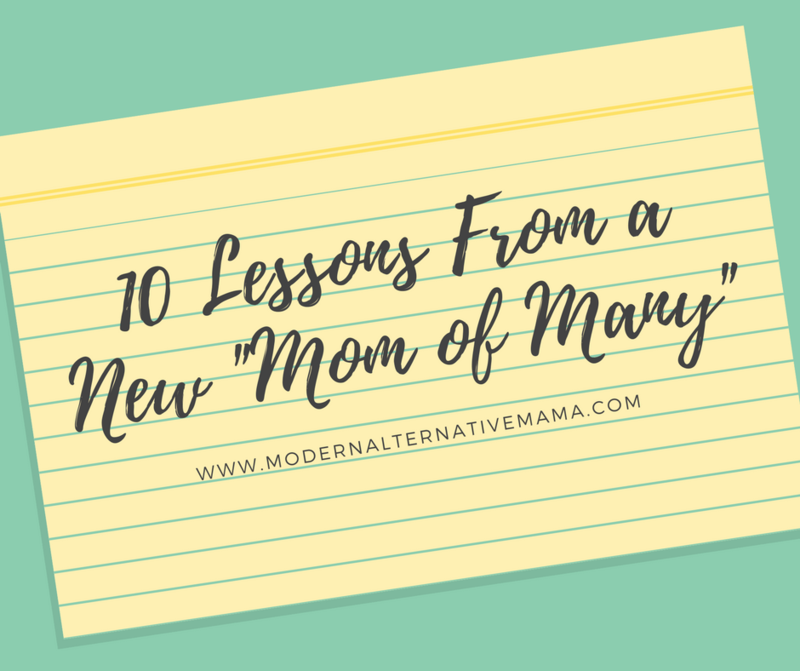 But, if you don’t remember to speak softly, or act patiently, or whatever else…know that no mother-of-many that I’ve met is magically more patient or “better” or somehow “super mom.” Nobody fails just because they can’t be amazingly patient and perfect. There’s just no such thing. At other times, giving them a job helps cut down on the chaos. See the “kids helping” part. It makes for chaos in the kitchen, but hey — it’s part of life. Despite the odd annoying moments, children are a blessing. Remember it. Talk to them, appreciate what they do. It was funny when my 20-month-old came in the house covered in mud, and I popped him in the sink for a bath. It was adorable when we visited my husband’s office and my 3-year-old offered to shake hands and introduced himself to everyone he met. It’s sweet when my daughter explains to me all the things she’s learned that day. And it’s adorable when my 6-week-old smiles and coos. 🙂 They are such fun and unique people! And it’s a privilege to get to know them and raise them. There is no magic to it. I do feel more patient and more prepared with four than I ever did before. I find it less stressful and easier to understand and deal with. But, I’m not super mom. I still get tired, upset. I still yell at them. I do lots of things I shouldn’t, especially on bad days. The good outweighs the bad absolutely but hey…I’m just as human and flawed as everyone else. Pray for grace. Pray for peace. Pray for understanding. It’s okay to make mistakes — you are going to. We all do. I even wrote about the mistakes I make a lot before. And sometimes we’re all the worst moms. But since your feelings matter too — it’s okay. Do you feel like super mom? So good to hear!! I’m pregnant with #3 and with two toddlers, things can feel overwhelming sometimes. I know it won’t always be like this and I try not to have too high of expectations for any of us! 😉 Thanks for sharing, it was very encouraging! Thanks for posting this. It’s definitely a reminder that we all can sometimes be that “Super Mom”! I’m so glad it gets easier with more instead of harder. I know some days are harder than others but I also think we learn more and more as we have more kids. Thanks again. It is, Marnita! There’s a point at which it’s hardest (when you have 2 – 3 littles all at once), but then they start getting bigger and it starts getting easier! 4 is easier for me than 3. 🙂 And nope, no one is super mom and that’s okay! As a mother of many myself, this is great advice. I would just add that as you teach your children the skills to help the burden becomes much lighter. Many fear putting too much of a burden on their kids, but when everybody shares the load nobody is overly burdened. This is so encouraging and incredibly inspiring to me. I am a mother of one VERY active 11 month old boy. My husband and I have always wanted a big family, but when I’m alone, it feels like an impossibility. I barely accomplish anything other than chasing after him. Some days, I’m proud of myself just for getting us both dressed! I despair of ever being able to handle more rambunctious littles, though that is my heart’s desire. This is so exactly what I needed to read. Thank you!! Hi Jessi, I really felt much the same way with only one. It was SO hard to do anything when the one child always needed all my attention. Now, my older three play together all the time and I have lots of time, and my oldest helps with the baby too! It’s totally different. 🙂 If you want lots of babies, have them! I have an 11 month old and feel the exact same! I so want a big family (4 or 5 kids), but most days I feel like I’m drowning in exhaustion with just one very active toddler. I am constantly chasing her around the house. I have little time for myself and am totally exhausted. Thank you for writing this 🙂 it is a huge encouragement to me, even just reading the different responses you have given people. I feel like it will be “easier” in some ways once I have a larger family and they can help and play together, but it’s the beginning that is the hardest (I can’t imagine being pregnant right now…much less having a baby and a toddler…etc, etc!) I feel like I’m going to have at least one baby for the next seven or eight years — and that scares me! Thanks Brianna! I’m glad it is encouraging to you. 🙂 Keep connected with your husband (I’m learning just how important that really is) and you two will be a team against whatever comes up! And each baby, regardless of personality, is “easier” too because you’ve “been there done that” and know how to help! Great post Kate! What a blessing to read your insights on living joyfully with a large family! My husband and I have one sweet 10 month old daughter and I follow pretty much all of your housekeeping tips because they’re just the most sensible way to do things. I often find that by the end of the week I’ve run out of regular chores to do and have to create extra projects for myself. I’m very much looking forward to adding more little ones to the mix to spice things up 😉 you said it well, children are ALWAYS a blessing and even when you’re a mama of one, working efficiently and staying on top of things helps you keep sight of that, especially on days when everything doesn’t go as planned. What an encouraging, unique post. It is counterintuitive, but makes sense at the same time. Even without children, I am always more productive when I am the busiest–because I have to be intentional and make things happen. Thank you! Loved this & so needed to read it! I was incredibly overwhelmed with #1…but now that I’m 4 weeks postpartum with #2, I’m doing more than I was when my first was 6 months old! Somehow, I still worry about how anything will get done when we add more children to the mix 🙂 Thank you for the reminder that God stretches us a little bit at a time! Hmm, I like these ideas, but you don’t have a large family yet! I just read a post by a mom of six who says she has a “semi large family,” and all the mothers weighing in had 6-9 kids. Most of the mothers commenting here have 1 or 2, so they probably think 4 is “large,” but in reality, that’s not a very big family. Sounds like you have great ideas in place for when you do have a big family though! “Large” really depends on who you ask. With the average family having something like 1.9 kids, having 4 is definitely larger than average and requires a different mindset than fewer kids. Most often I don’t feel like I have that many kids. Others seem overwhelmed by four and make comments about it. But really? Family size isn’t something we need to comment on, and neither is someone’s perspective on “how large is large.” Everyone’s ideals are different and that’s okay. Four kids is plenty large. I believe now, she has five. I only have two but always wanted five. My aunt had four, my parents had three. The article wasn’t about her big, beautiful family. It was about how to handle life with so many little blessings running around. Thanks Kate, this is just what I needed. I have a 9 month old, and have been really going backwards and forth about whether I want another one, as looking after a baby and a toddler just seems so daunting. Great advice. I smiled when you said you tried to learn all you could about big families. I never thought of doing that, although I guess I do like to watch people who parent well. I never thought my family was especially large (6 kids) as many of my friends were from larger ones, but people said rude things to my parents about us all the time so I guess 6 seemed like a lot – maybe because we were all under 8. . . My mom said it seemed like there were fewer of us as we got older. As the oldest daughter I know first hand that she had less work to do as I got older 😉 Anyway, it is amazing how fast our society’s view of family size has changed. People were shocked that my husband and I would have a third when we already had a boy and a girl. But most of those shocked people have several siblings and we live in a place where families of four or more are still pretty common! I figure that at 3 we’ve only just hit replacement rate, now we have to start picking up the slack for everyone else! Hi – as a mother-of-10, (grandmother now) I encourage all you lovely mothers of larger families! May I make a suggestion that may help some of you? At one stage I got very tired — so tired it was hard to think by the end of the day, and sometimes dinner was very late because of this. So I started giving them their cooked meal for lunch. I was homeschooling the children so they were all home (talk about multi-tasking!). They loved it so much they stopped snacking in the afternoon, and we had sandwiches for our evening meal. Made things so much easier! Hardly any dishes to do at night, and we saved money on snack foods and even bread, because they ate less. Made the evenings a lot easier to cope with, and no more late dinners! Thank you for posting. I am a mom of four and have realized so much if this to be true. My only question is how do you keep the older kids quiet when the baby is sleeping. My 11 month old sleeps late and takes an afternoon nap. My 2 oldest wake up early and don’t nap any more. I feel like so much of my day is reminding them to be quiet. Among suggestions would be great!! Especially for the morning hours. I have five and it’s been a learning experience. You pretty much pray, laugh, cry, fail, succeed, and try again. There are good days and bad. I am glad to hear others saying 4 is not many! I was expecting 6 or more! I have 8. The real challenge comes when you are forced to enter paid work. So much is then not possible. Much of my life was like this for my 11 years at home but since paid work it is grinding and difficult.